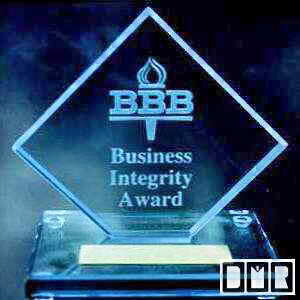 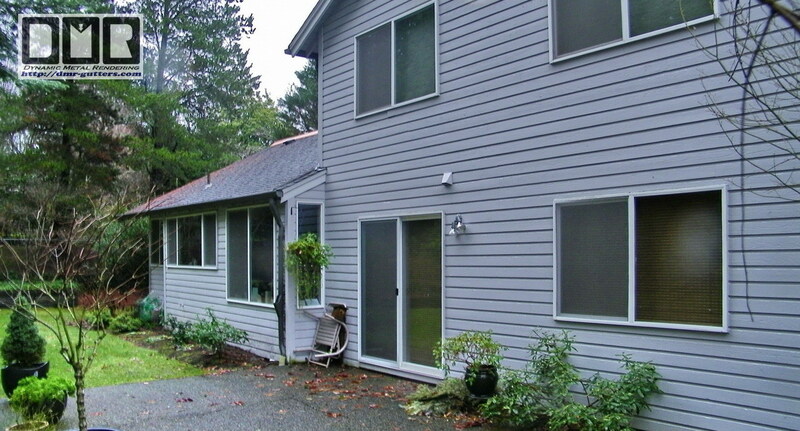 I had already replaced gutters for her Son; Andrew Pulliam back on 4/07, so this was a fairly simple sale. She had contacted me on 8/9/08 to get a bid for aluminum gutters and a set of the copper ridge caps I make for moss control on her roof. 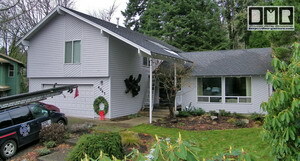 I had a promise start date of 1/22/09, and I managed to get it completed by January 7th, ahead of schedule. 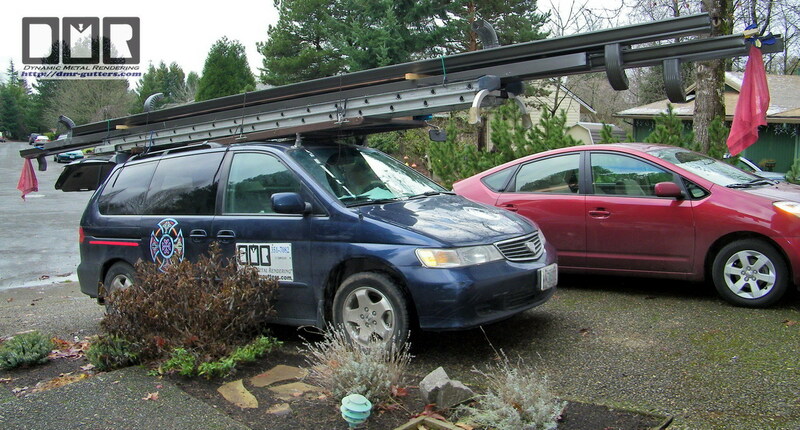 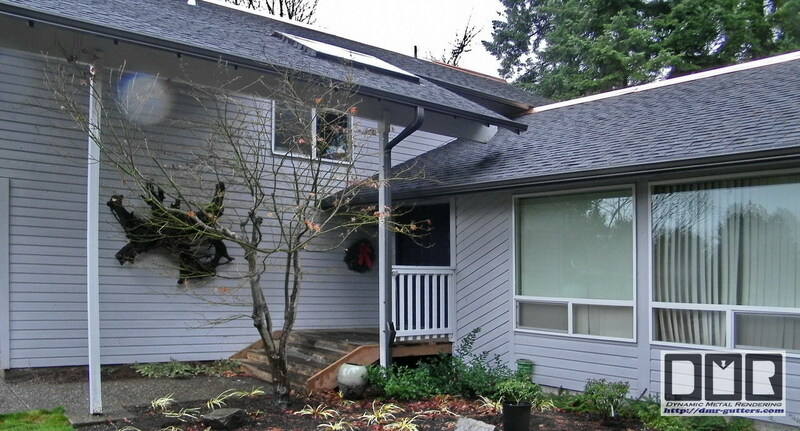 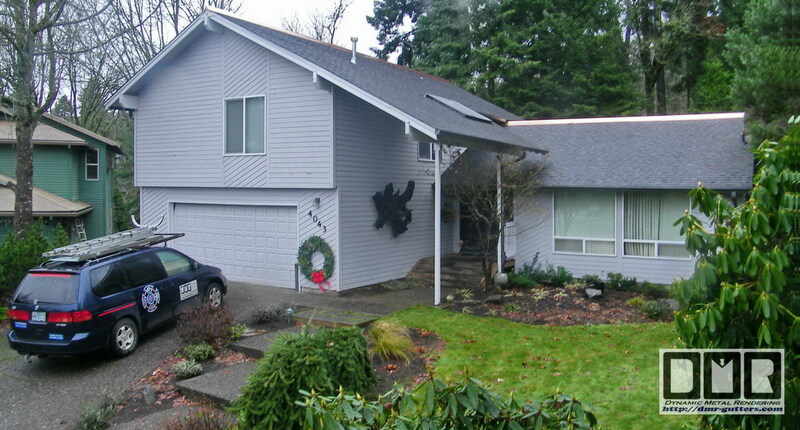 I had shown up first on 12/31/08 to remove the old steel fascia gutters and get the exact measurements with placement of each rafter tail for the hidden hanger placements. 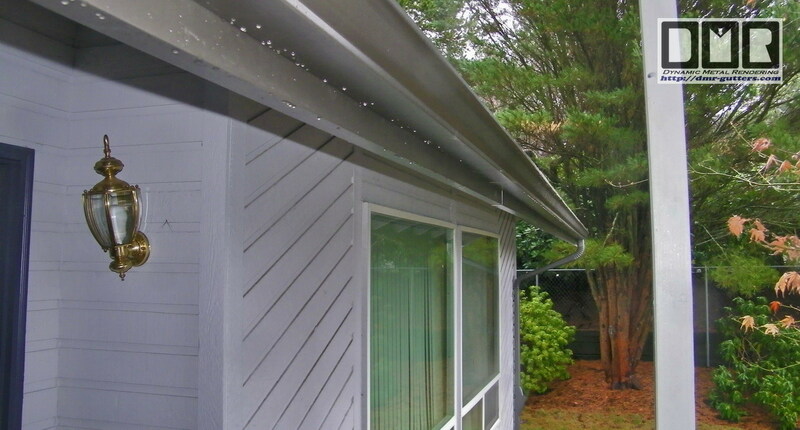 Those steel gutters had not even begun to rust yet, but had become dislocated from the house and the client was fed up with them not working. I spent a couple days in my shop processing the gutters and make the Leaf-caters and reducers. I managed to get back out to install the gutters on Monday the 4th. 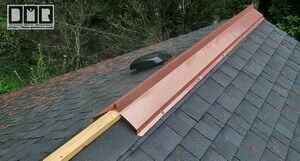 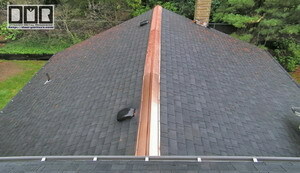 It also needed drip edge flashing you see here to seal the roofing to the gutters. 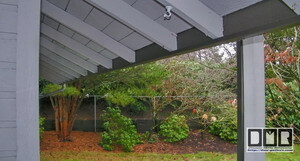 These shots also show the deluxe hinged leaf screens I install. 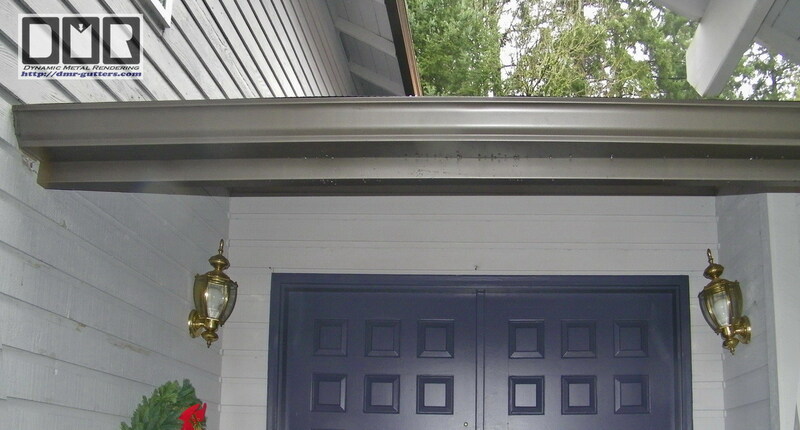 As a perk I decided to add make 30' of fascia metal with the extra metal I had left over and added it to this gutter in the front over the entry at no charge. 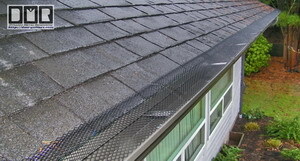 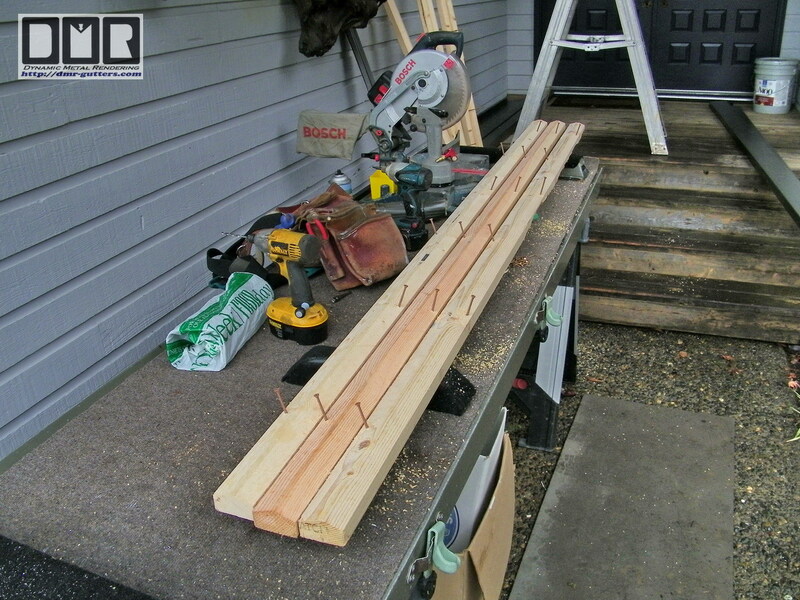 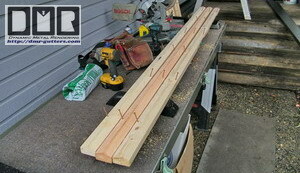 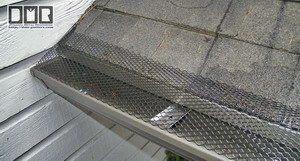 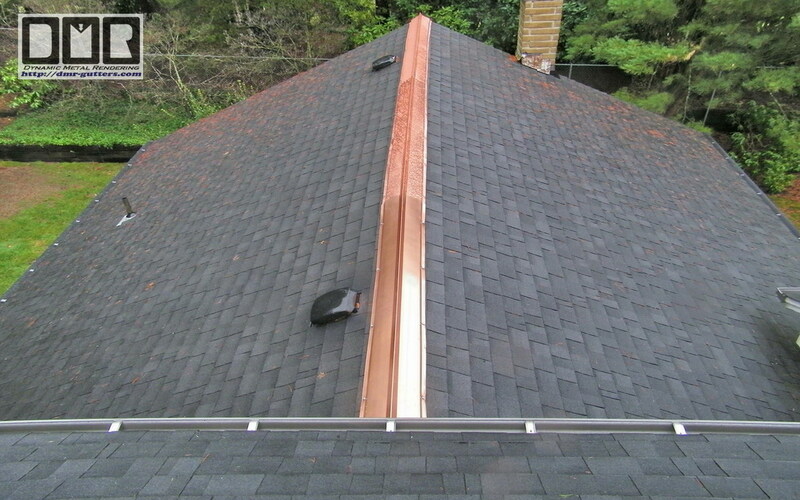 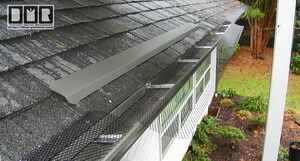 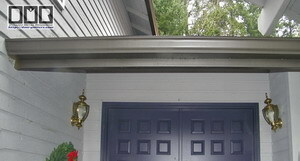 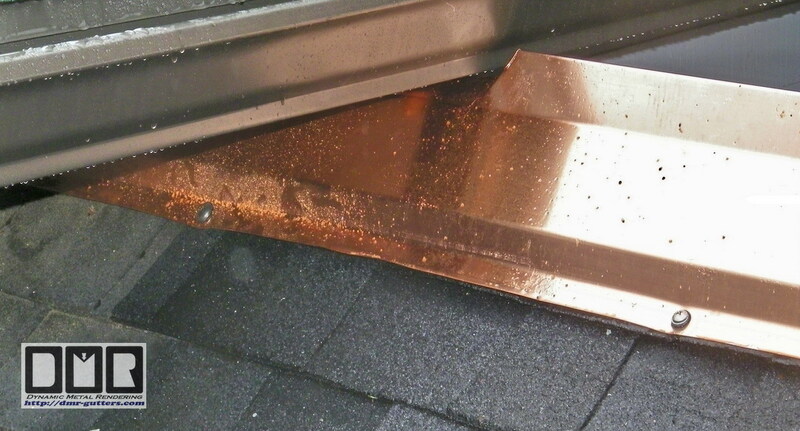 It hides the ends of the rafter tails like a fascia board, but does not push the gutter out away from the roof. 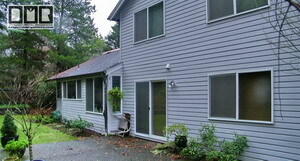 Here is a glimpse from behind. 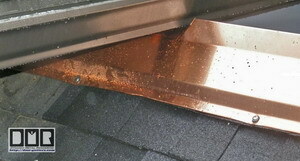 I made these custom ridge caps from large 3' X 10' sheets of 20oz copper slit down the middle for 18" wide sheets. 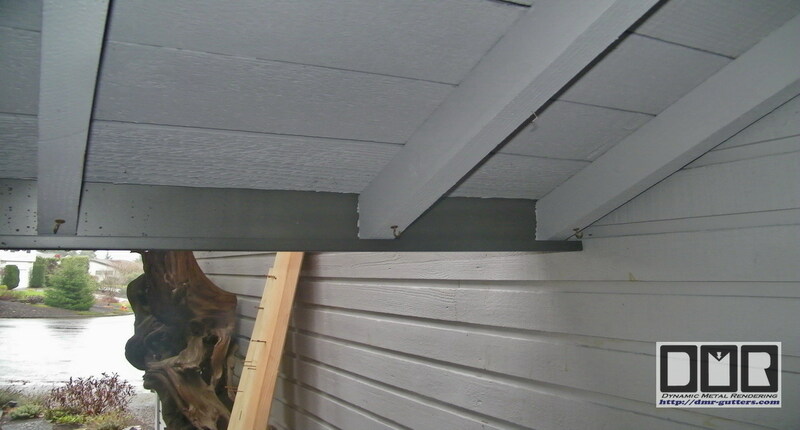 These boards attached along the top peak with these 3" deck screws for support. 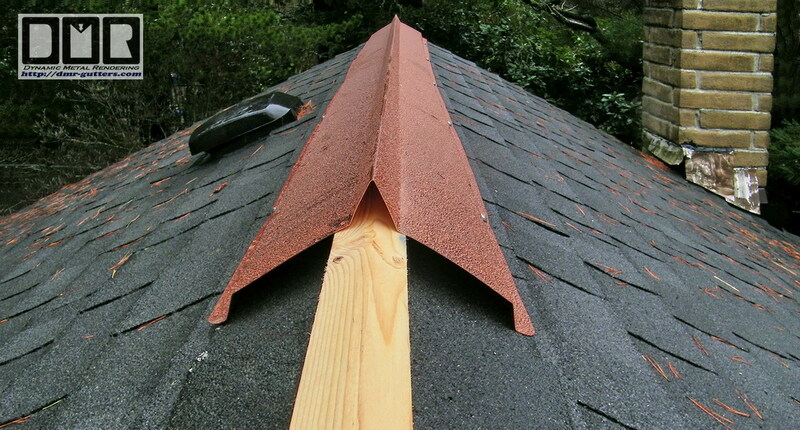 Besides making these ridge caps look more interesting this bend configuration also adds strength and detours birds from resting on them and pooping all over the roof. 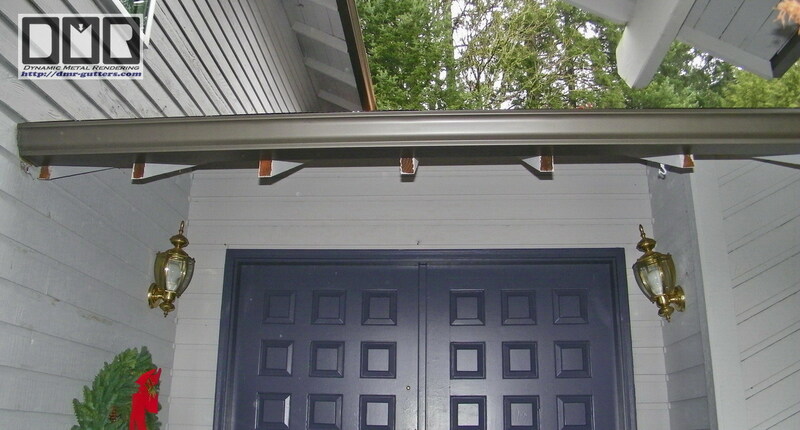 I did not manage to get a photo of it but these are strong enough to stand on them with all my weight without risk of them getting crushed or even dented. 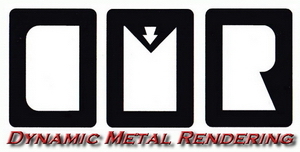 Here is a few more shots of the final look front and back. 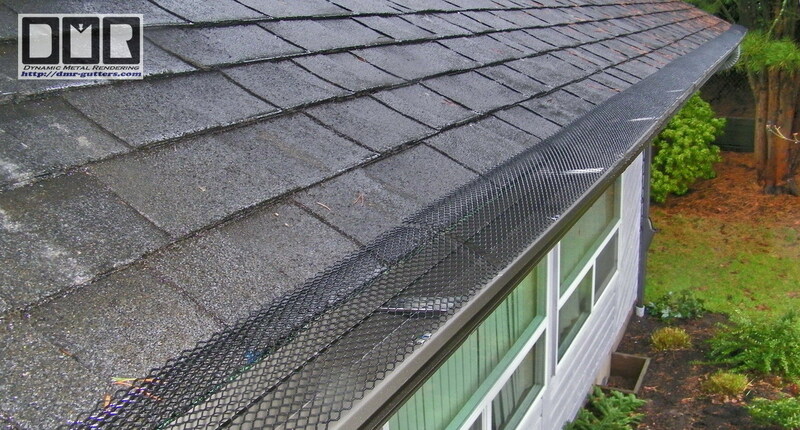 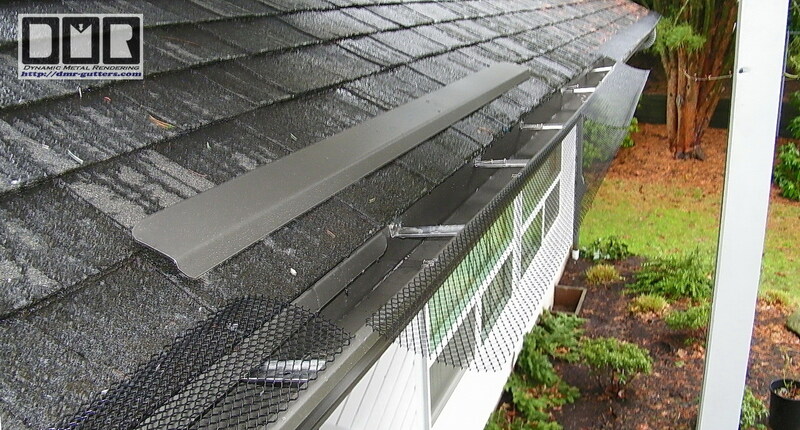 This was a fairly simple installation, once I had the exact measurements and a couple days in my shop processing these gutters and Leaf-catchers. It only took 3 day to get these gutters and downspouts attached and finish the ridge caps with treating the roof with moss killing powder to give the roof a good head start.